The title of ‘Lady Macbeth’ may suggest another adaptation of Shakespeare’s famous tragedy, perhaps with more of a focus on the character of the title than most contemporary adaptations, but this film is actually based on a novel by the Russian author Nikolai Lestov. It does share some similarities with Shakespeare’s work, mainly in the focus on a strong female protagonist who is driven to commit an act of murder, but it also encompasses themes of the female role in 19th century European society. The ‘Lady Macbeth’ of this film is Katherine Lester (Florence Pugh), a young woman who has been forced into a loveless marriage with an older man (Paul Hilton), and who is forced into a strictly controlled lifestyle by her father in law (Christopher Fairbank). From the outset, a tense and moody atmosphere is established within the confines of the family home, where Katherine is forbidden from leaving. Director William Oldroyd effectively depicts the mundane and controlled lifestyle Katherine is forced into living, and this helps to explain her actions when she seeks to take some control back. It begins when she falls for one of the men working on the estate (Cosmo Jarvis), and they start an affair that doesn’t go unnoticed by the other people inhabiting the house and the surrounding areas. This is all driven by an unbelievable performance from the outstanding Florence Pugh, previously seen in Carol Morley’s ‘The Falling’. She dominates every screen with a powerful performance of cold and calculated dispassion, and watching her command the frame is a magnetic experience. On this evidence, she deserves to go on to bigger and better things. 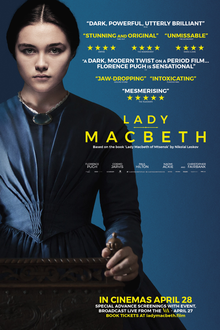 The plot of ‘Lady Macbeth’ unfolds in a calm and measured fashion, heightening the impact when sporadic bursts of violence break through the icy atmosphere, and Oldroyd superbly builds a growing level of suspense as the net closes in on Katherine and her crimes. I thought ‘Lady Macbeth’ was a terrific piece of cinema featuring a star making performance from Florence Pugh, and I hope a lot of people take the time to go and see it.